Feel like the belle of the ball in this incredibly beautiful wedding dress by designer Stella York. This new dove satin wedding dress has a romantic sensibility that can’t be beat. 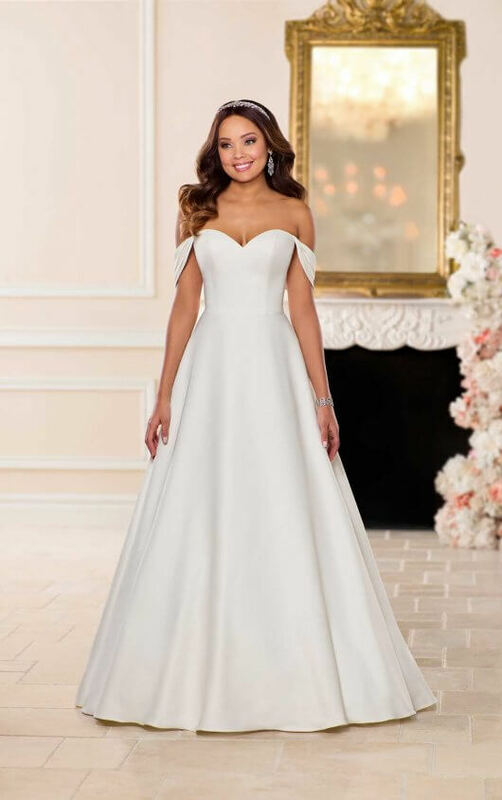 Lovely off-the-shoulder straps that drape elegantly down the bride’s arms come as a detachable accessory, allowing brides to change up their look from ceremony to reception. An easy-to-wear shape with a sweetheart neckline and natural waist are flattering on any figure. This wedding dress also comes with on-trend pockets and can be easily accessorised with a veil. Affordable and chic, this gown comes either in a button finish or is available in a lace-up back and is also available in plus size.